Working out is boring. Running on a treadmill is especially unbearable. If you pay a monthly membership for that privilege, you’re probably accustomed to some high-tech machines with gadgetry to keep you occupied. But if you exercise at home and are on a budget, maybe your cheapo treadmill could use some more bells and whistles to keep your mind off the endless-running-while-never-getting-anywhere thing. Lucky for me I had all this stuff already, that’s why I dreamed up this plan. 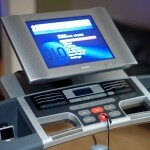 Assuming you already have a treadmill, the first thing to do is decide how and where you can mount the LCD. 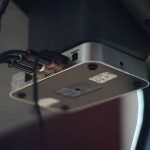 My particular model had a large empty space of plastic on the console above the controls, a perfect spot to attach a TV mount. 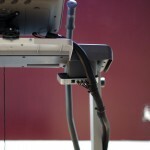 If your model doesn’t have enough space for a mount or the LCD panel, you may need to use a pole or brackets to extend & float it away from the controls. 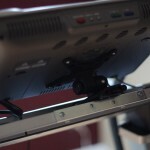 Mine had just enough space for to attach this mounting bracket that frequently goes on sale for $11.99, like today! This bracket is a two piece design – plate and bracket. 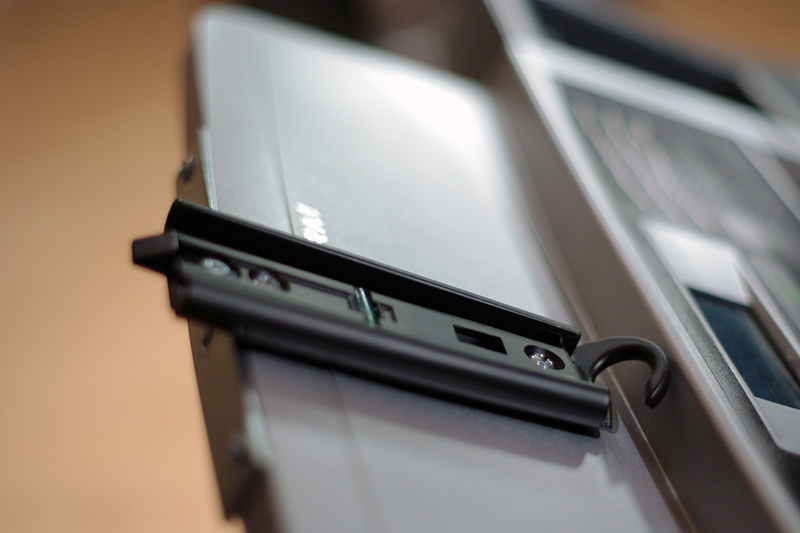 I attached the bracket to the back of the LCD panel (VESA Compatible, 4 screws). I then measured out and marked two holes to drill and used 1/2″ machine bolts to attach the mounting plate. One thing I discovered with this mount on this application is that the built-in bubble level is deceiving when you’re not mounting on a flat wall. Just ignore it. I had to mount the plate at an un-level angle, tilting to the left, to compensate for gravity. I suggest holding up the actual LCD panel (to make sure IT’S level) on the plate and adjusting it to mark your drill holes. 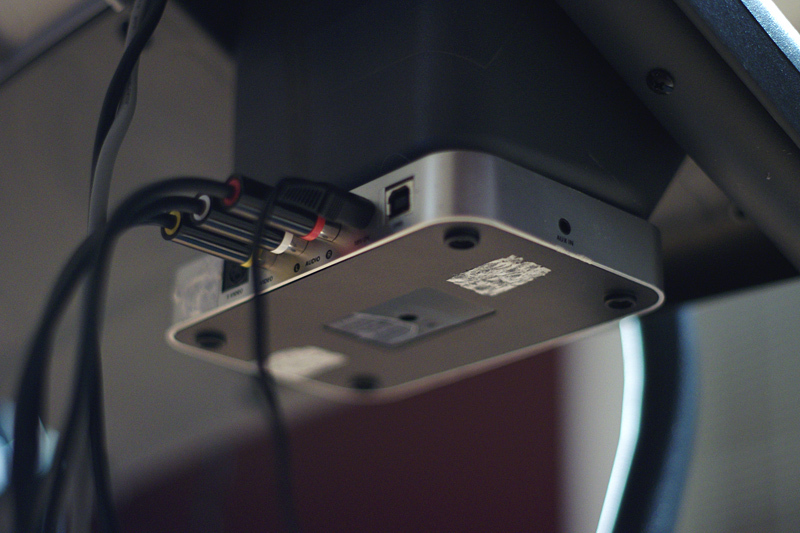 Once the mounting plate is in place, slide the LCD with bracket into the plate until it clicks. 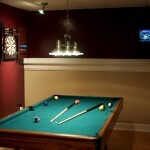 Run the power cord, cable/satellite, and any other A/V cables and you’re ready to roll. 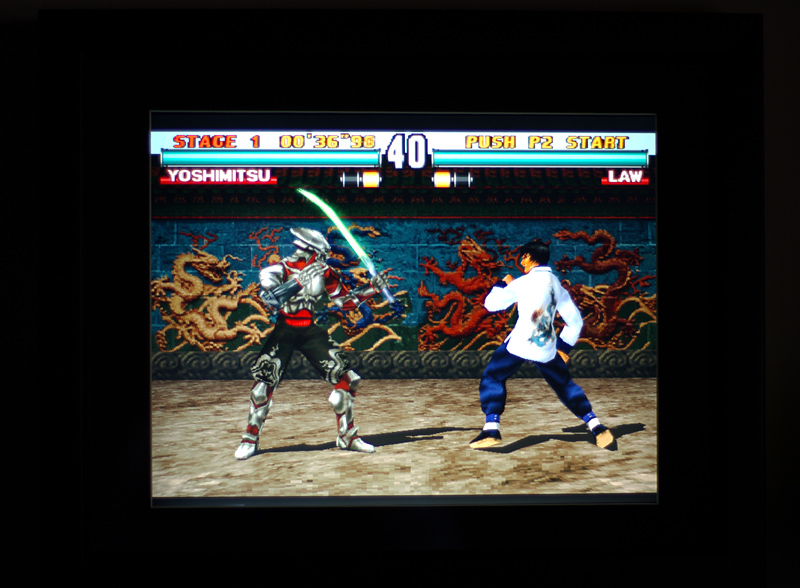 The LCD might be a little wobbly when you are running at a speed of say 4+, like it was in my case. 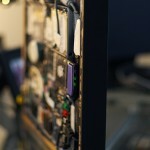 This was due to the flexible plastic that the LCD was mounted to. I decided to bolt a 12″ steel plate to the plastic for additional support. This worked very well. I took it a step further and added a DLO Homedock Deluxe (the one that used to live in my Jeep) to the setup for music and videos. I decided to mount it underneath one of the cup holders on the treadmill. I cut a hole (Dremel with cutting attachment) out of the bottom of the cup holder and bolted the Homedock underneath it, with the dock popping through and up into the cup holder area. You could use brackets to mount the Homedock, but I chose to dismantle the Homedock and drill holes in the plastic on top to bolt it directly to the treadmill. If you choose to do this, be careful to choose where to drill the holes wisely based on the electronic components that might be in the way. Also make sure your bolts aren’t too long, you don’t want them butting up against the hardware board! 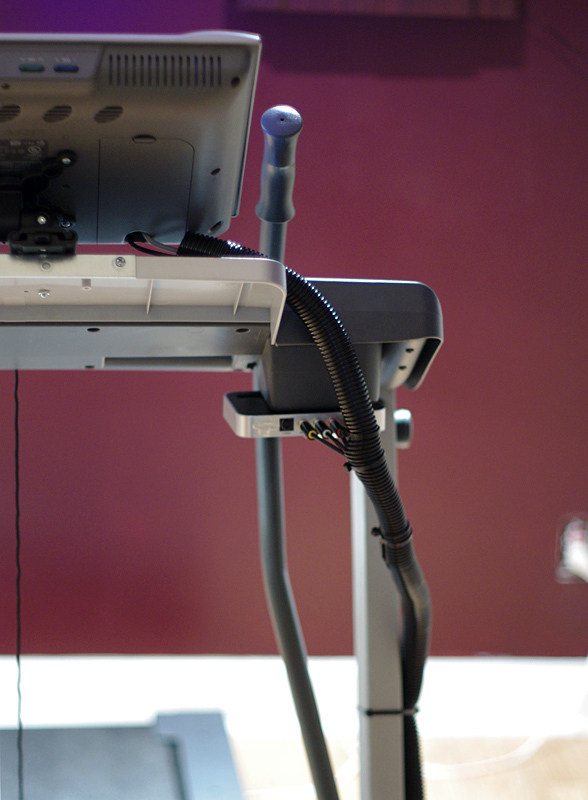 Run (organize and hide) the cables and you’re g2g. 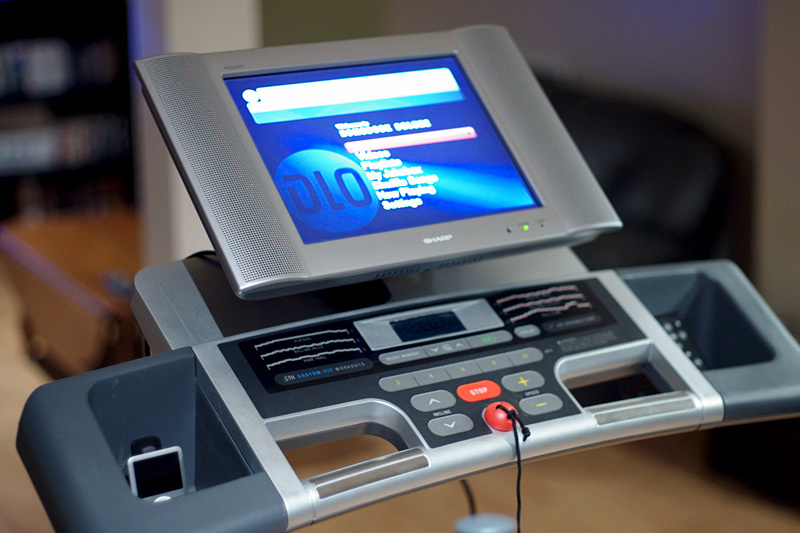 The DLO Homedock gives me the ability to listen to my iPod music through the LCD TV speakers, view the album art and information on the big screen, and control the music with the little remote while I’m jogging. I also ran a RCA Audio cable (red/white male) to 1/8″ Stereo (female) from the TV’s audio out jack. This allows me to plugin a pair of earphones instead of listening to the speakers if I choose. 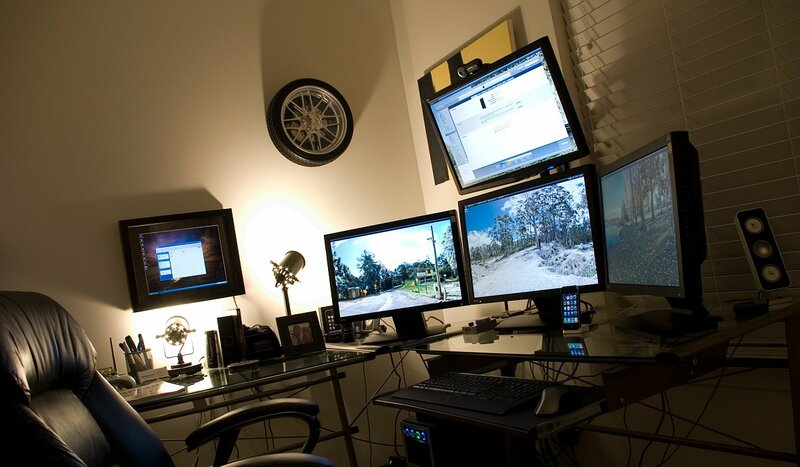 Obviously, the setup is also great for watching movies and tv shows that you have loaded on your iPod. Is running on the treadmill more enjoyable for me now? Definitely! Will I keep up with it, or will it again turn into a coat rack? Who knows… but it was a fun project nonetheless. The Wall-PC no longer lives in my office, as I have found it better suited for other tasks in our new house. 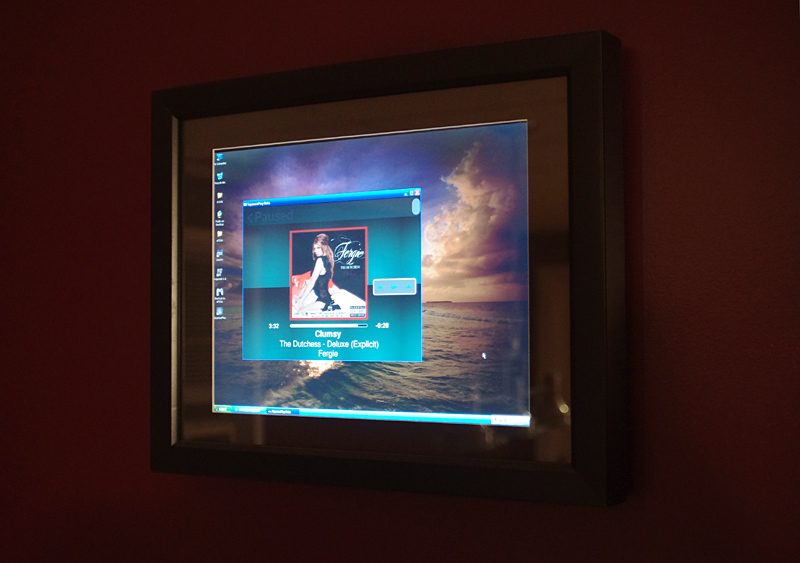 I run a network of software Squeezeboxes (home music servers) in my house and the Wall-PC made a perfect wifi Squeezeplayer in our new finished basement. The Wall-PC displays the current album art, title, etc. that’s playing via Pandora or my MP3 library while also having the ability to control the playback and volume in the basement and throughout the house. 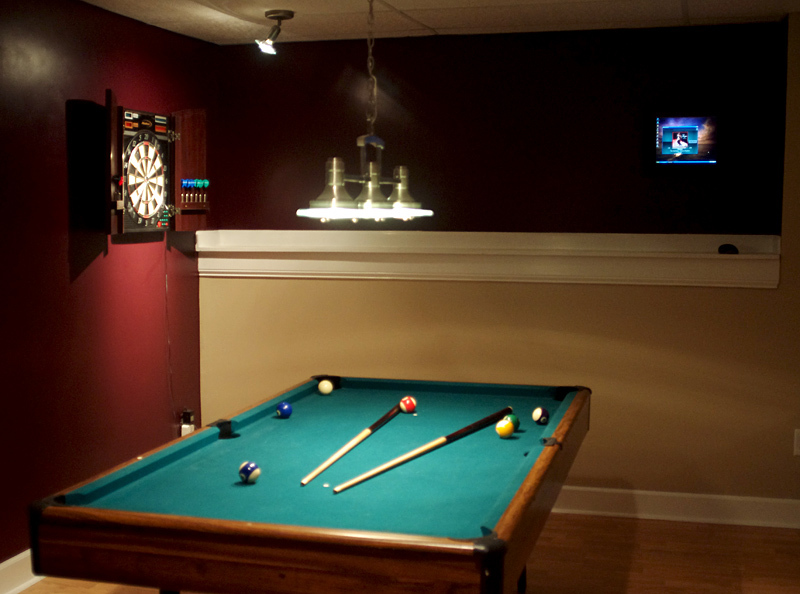 The Wall-PC is also frequently used to display live sports scores and Fantasy Football scoreboards during a game of 9 ball or cut-throat. I cut out a small square hole out of the drywall and ran the power and composite audio cables up the wall and across the ceiling to my audio receiver’s inputs. I had to use a wire hanger and a bit of patience to run the cables due to the fiberglass insulation behind the drywall. The power brick is now hidden flush inside the back of the frame. 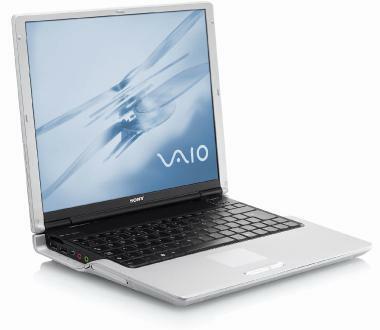 This was possible due to the extremely thin Sony Vaio AC adapter. The Wall-PC is controlled via a ATI Remote Wonder RF remote and a Logitech MX Revolution wireless mouse. Although it can be a bit buggy at times, I highly recommend the Logitech Squeezebox software and hardware. 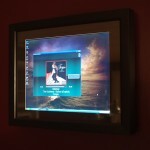 It is compatible with almost every online music provider as well as your own libraries and allows you to sync your music throughout your entire house. It is also actively updated and continually supported, in fact there was just a major update that overhauled the whole UI on the software player, server and remote which made it even better! I will post additional details on my home wifi music setup in future posts. Everyone looks for an edge when dieting and trying to lose weight. There are more gimmicks and ridiculous diets out there than I could name, but if you have an iPhone or iPod Touch there are simple things out there that can greatly enhance working out and dieting. The first day of the year I set out to get back in shape and lose a considerable amount of weight before my wedding in July and I researched ways to track, get educated, and stay honest in my quest to meet my goals. I started with the idea of using a web app called Traineo to track my weight loss and exercise progress, but quickly noticed there were some critical UI flaws and bugs in this app, and you had to be at your PC to utilize it… which became cumbersome. So I started looking for something I could use on my iPhone that I always have with me. 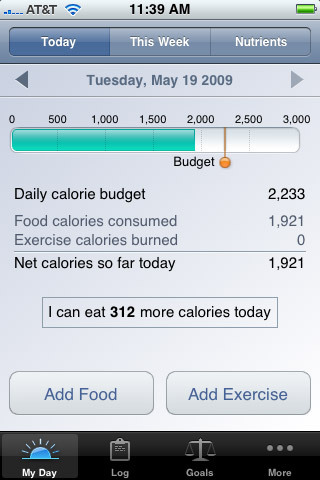 and recommends a daily calorie budget for you based on your physical traits. Where it really shines is the ease of entering in your food throughout the day, you can search for just about any type of food and it will return an accurate count of calories, servings, etc. It also includes a decent database of exercise workouts and activities for you to enter, which are factored into your total daily calorie count. 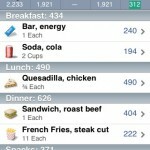 It’s fast and easy and becomes even faster as it starts remembering your meals and foods you have eaten before. I can usually pull the phone out of my pocket and log a meal in less than a minute and log a whole day in less than two minutes. 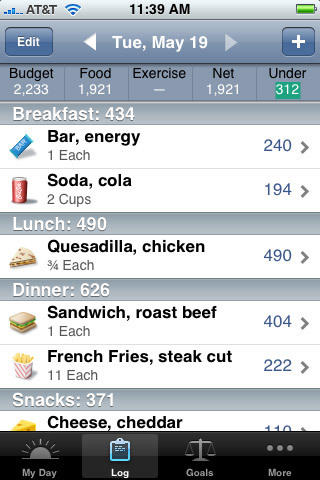 I don’t need to wait until I’m at a PC to enter in my meals… with this iPhone app it’s easier and makes it less likely for me to forget a meal or forget to log a day altogether. I give this app my highest recommendation, it is solid and free. different exercises included, all featuring photos, descriptions and suggestions. It is also very useful for logging your reps and sets. Another option is iPump Dumbbells (iTunes Link) which has a huge database of free weight exercises and a collection of workouts to follow and progress through, with varying difficulty and intensity. 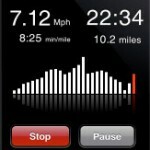 For running, Runkeeper is the best app I have found. 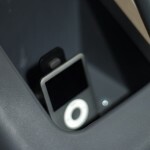 It is very similar to the Nike+iPod kit for regular iPods. One of the most notable features is the ability to track your run via GPS on a map, which is very cool. You can see exactly where your path took you on an overhead map, along with all the run statistics you could use. 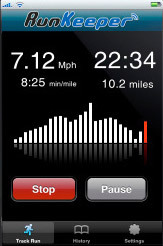 Although not quite as accurate, I think it’s the best alternative to the Nike+iPod for the iPhone 3G. My first goal was to lose 40lbs by April 1st, which I accomplished. I have now lost almost 50lbs and am still shooting for my ultimate goal of 65lbs before the wedding on July 31st. 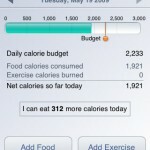 I won’t say I could not have done it without these apps, but they certainly made it easier and even more fun! Playing a round of Tiger Woods golf for iPhone while on the stationery bike. One round takes about 30-35 minutes and makes the time on the bike really fly by. And finally, there is probably a useful recipe app out there but I have not had a chance to look for one yet. Recently, I was lucky enough to take part in an innovative office team building event at Sofla Web Studio. The event took place on Friday the 13th and featured an appropriate zombie theme. We utilized a popular online cooperative team game called Left 4 Dead for the exercise. Working together and planning strategies to blast our way through hordes of zombies… it doesn’t get any better than that! Read details and see photos & video of the event at the Sofla Web Studio Blog. Many people move around to different addresses, and change their phone numbers multiple times throughout the lives of their pets. 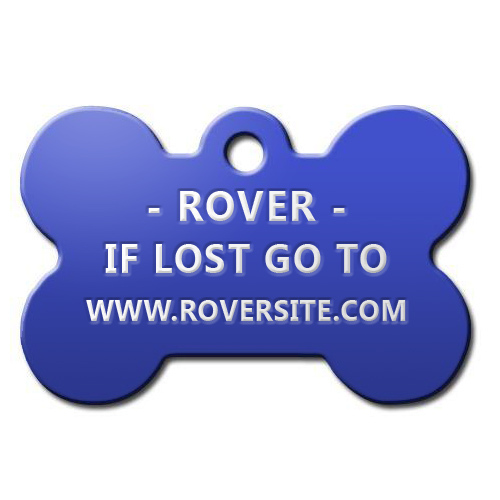 Updating your pets ID tag every time you move or change numbers can be a pain and if you somehow forget to update it, there could be very costly circumstances when Rover runs away. Thankfully, I have a easy and cheap way to solve this problem! The solution is to use an address that will never change, a domain name address (URL). 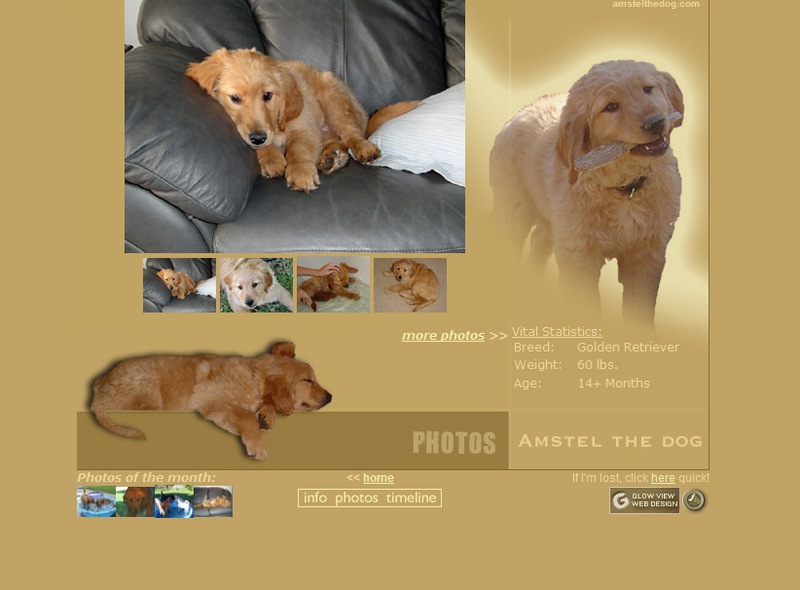 The first step is to register an appropriate domain name, in my case I chose amstelthedog.com. A domain name costs roughly $7 a year, about the same price or cheaper than a dog tag. Once you have the domain name picked out you will need a web hosting service. There are many free hosting services available, here is an article on Lifehacker.com featuring the best free hosting providers out there. Another option would be to create a free Blogger, WordPress page, or even engrave the URL of your Twitter or Facebook page. Note: You could also create a short & catchy domain name and have it redirect to anywhere you wanted through the domain settings. Now once you have a domain name and hosting provider, you will need to put some details on a simple web page. Maybe your email address, or your home address and phone number if you don’t mind having that information out on the internet. 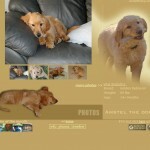 Information about your dog and details about what to do and how to contact you if the pet is lost would also be helpful. If you want to get fancy and you have some HTML skills you can create a simple web Contact Form, where they could enter their name, phone number, & message and click submit. 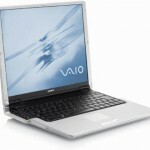 That way you would not have to display your email address and other personal information to the public. You can also have the form send to multiple email accounts. An easy way to create a contact form is to use a free Google Apps account. Using Google Docs you can quickly create a simple contact form with email notification. There’s almost no HTML or web design knowledge required. Here is a nice tutorial video on YouTube on how to do this. What if the person finding the lost dog doesn’t have access to the internet, or understand what the address means? The internet and domain names are so mainstream now that it is unlikely someone won’t know what to do with it or be able to ask someone that will understand it. I guess it will depend on your neighborhood or geographic location, if you feel comfortable with it or not. Why not just engrave your email address? E-mail addresses are more likely to change. You can’t control where the submissions are coming from or how they are formatted, so they are more likely to get marked as spam. Also, in most cases it will be harder to fit your email address on the tag, than it would be to fit a domain name. What if an important email from my neighbor gets caught in my spam filter? Format the incoming submissions so they don’t look like spam and use a trusted “from” address in your form. You could also have the form submit to multiple email addresses. You, your spouse, a work email, etc. What if I can’t fit the domain name or important information on the tag? Pick a small domain name and leave out the “www.” if you are comfortable with doing that. I fit everything I needed on a very small tag for my new puppy. Won’t my email address and form get hit by spammers? If you do not spread your URL around, promote it at all, or submit it to search engines then the chances of it getting hit hard by spammers will be relatively low. What if I don’t immediately have access to check my email? You could set it up so that emails from your lost pet form go straight to your cell phone via SMS, using an SMS gateway or other service. One final option is to use Google Voice / GrandCentral. Last week Google launched a limited release of their new Google Voice app. This allows you to have one phone number assigned by Google that you can keep with you your whole life. You can then manage your home, cell, work numbers from the account and set up appropriate forwarding. 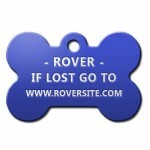 If you are lucky enough to have an account, you could use that number on your pets tag! So there you have it, a lot of good options to go ‘high tech’ with your pet. The idea was to dismantle the laptop and put the guts of it into a new enclosure. 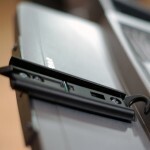 I wanted the laptop to act like a flat panel and cleanly hang on the wall. I decided a shadow box frame would be a perfect solution. The challenge was finding an appropriate frame with the correct dimensions, both width/length and most importantly depth. I spent a couple months browsing shadow box frames here and there. At craft stores, online, frame shops, etc. I was not finding anything the correct size, shape, and color. Finally, I stumbled on a suitable frame at Marshalls Home Goods store. It had an ugly sea-shell display inside of it but I figured I could just tear it out and apply a new matte myself. 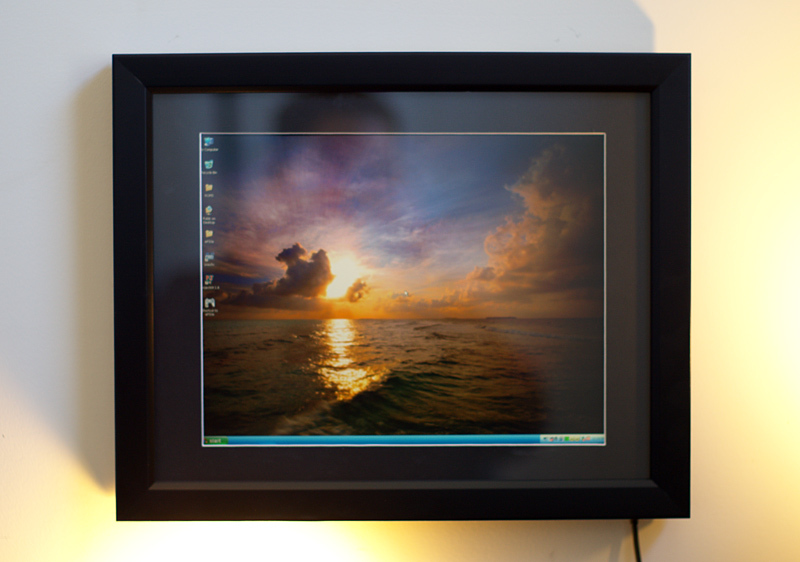 Why hang a computer from the wall….? 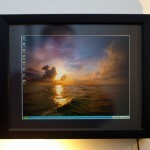 I learned fashioning your own matte for the frame is challenging for a novice and it is nearly impossible to find a pre-made matte to fit the non-standard (in the printing realm) dimensions of a laptop LCD screen. I got lucky and found a matte made specifically for certificates at Michaels, that fit it nearly perfectly. I had previously attempted to measure and cut my own with sloppy results, I would recommend getting it cut at a frame shop. 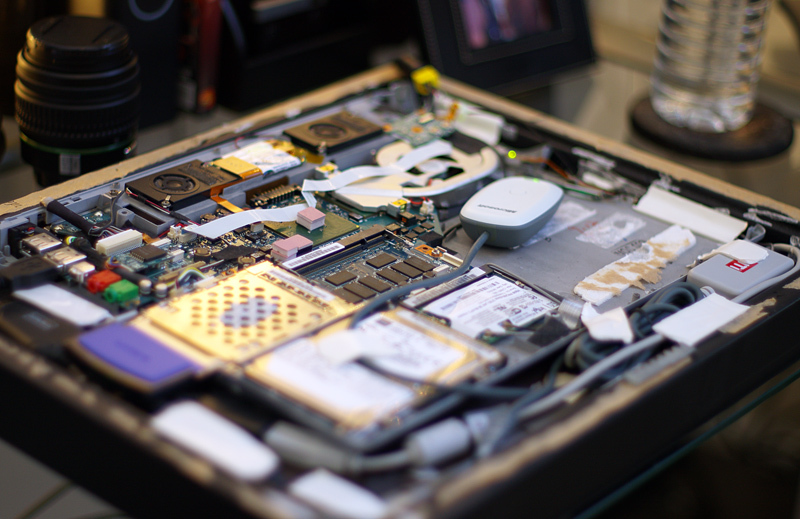 Dismantling the laptop was relatively easy. It’s just a matter of finding the many tiny screws and taking away each piece in the correct order. 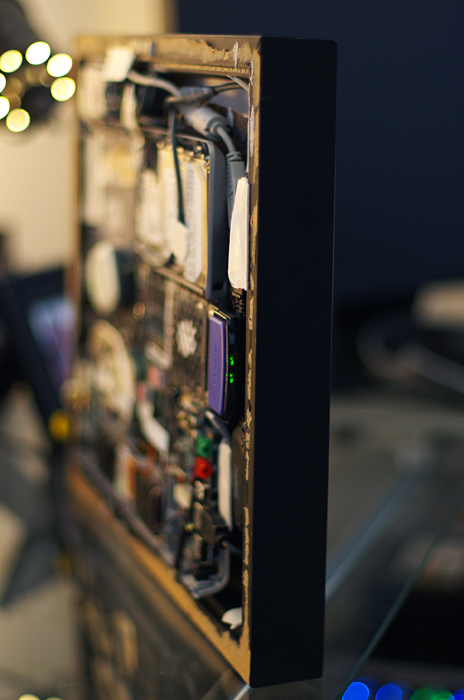 With a little patience and a careful hand, it’s hard to screw this part up. I took away all pieces I didn’t need and removed the frame and backing of the screen. 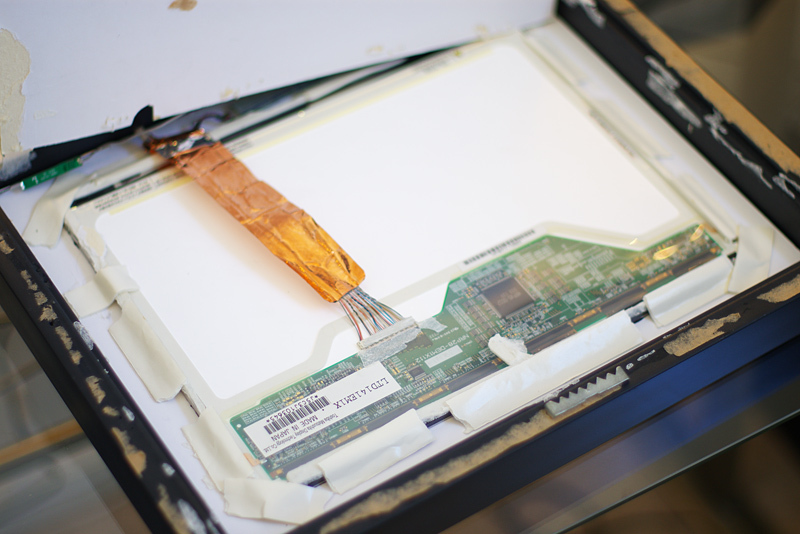 Be careful with the screen dissection because laptops often have the wireless antennas placed inside the top lid on either side of the LCD screen. I made sure to preserve those antennas and wire connections. After this, I was left with the bottom of the laptop with no keyboard and the naked LCD screen. 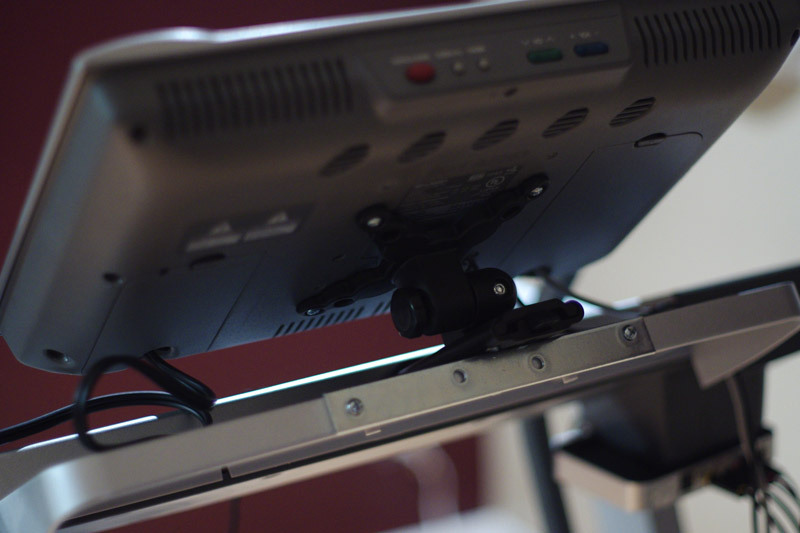 This is not a step by step tutorial, as every project and laptop/frame will vary somewhat… but basically I took the screen flipped it around and put it behind the laptop while making sure it wasn’t upside down. 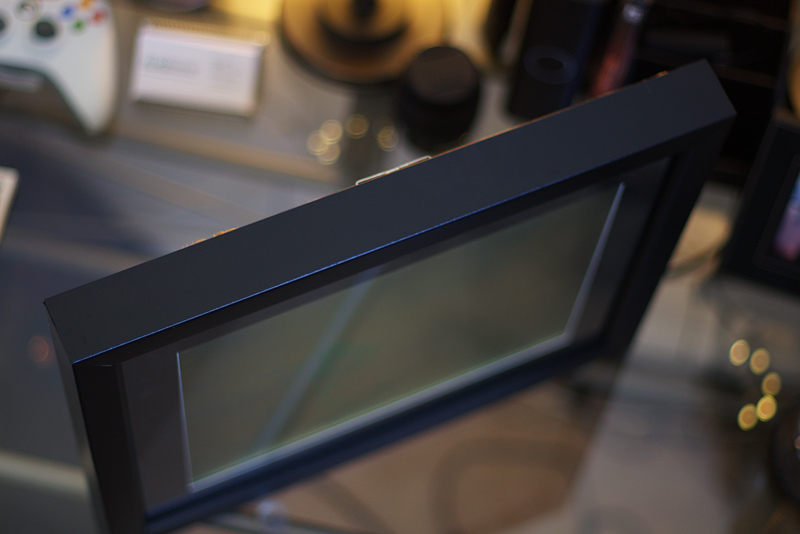 Everything seemed to fit, so the next step was to attach the screen to the matte and attach and fit everything inside the frame, so it hangs flush on the wall. I chose to use double-sided tape for most of the securing, which doesn’t look too pretty but it worked out fine. Once everything was together, time to plug in, hang on drywall screw and enjoy my new Wall-PC! View details about my home office and Wall-PC on Flickr. 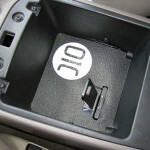 Almost two years ago now, I installed a DLO Homedock deluxe in my Jeep Liberty. This dock was designed for home use only, but I thought it could be the perfect dock for car integration. 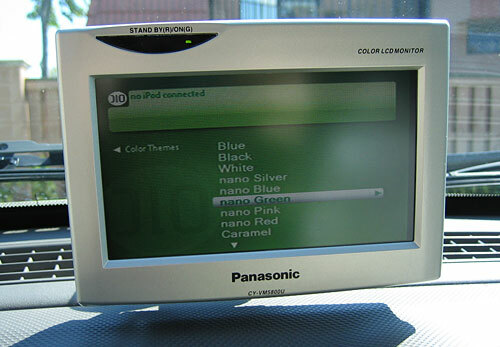 It would power on/off with the ignition, remember where you last left off listening or viewing, keep the iPod charged, hide-away nicely, operate remotely, and work well with my already installed 6.5″ widescreen LCD display. 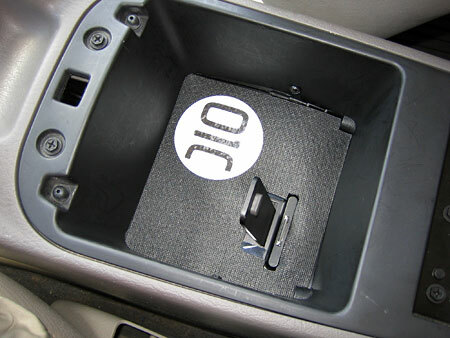 I decided to install the dock in the center armrest console where it would be easily accessible for the driver and passenger while remaining hidden. First, to power the dock I used a 200 watt power inverter, cut the cigarette adapter off the end of the cord and wired & grounded the inverter straight to the fuse box. The sunroof is only powered when the car is actually running, so I chose to wire the inverter to that fuse. For the controls I used the included remote. Since the dock would be in the armrest where it would be unable to receive the remote signal I had to use an Infrared remote extender kit. The IR extender was also designed for home use and AC powered, so I plugged both the receiver and transmitter units into the inverter as well. I attached the dock underneath plexiglass with a hole cut out for the dock connector. 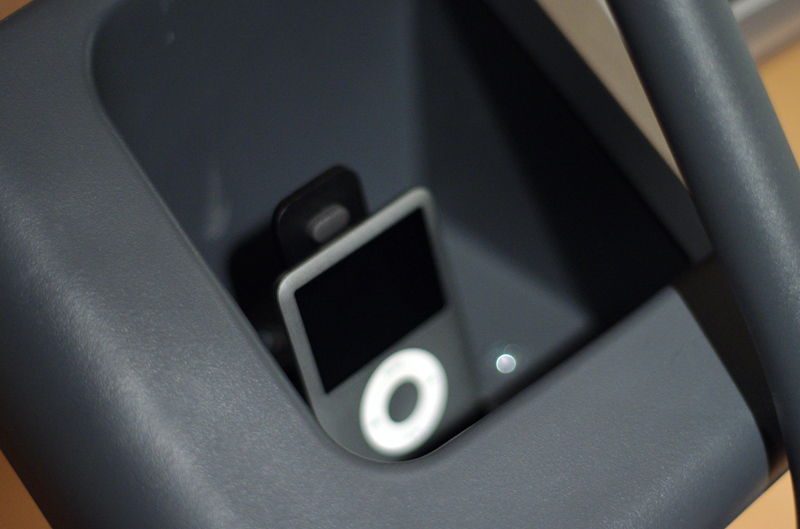 I cut out the bottom side of the plastic container in the armrest because there were slots for CD’s. The plexiglass was used as a new bottom for the container. I used cabinet liner from Lowe’s to cover the top of the plexiglass and stuck the DLO sticker included with the dock onto the liner. The connections to my current car audio/video setup were quite simple. 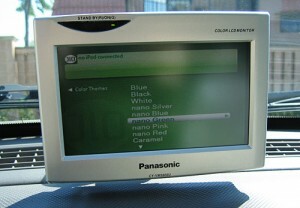 My LCD had a composite video input and my in-dash receiver had 2 composite audio inputs. I had to tear up a lot of the car for the wiring, but it is an American car and most everything snaps easily in and out of place to run and hide the wires. After using the setup for some time there are some issues I have encountered. The DLO homedock has a nice interface very similar to the iPod UI. It is great to use a large screen to navigate through your iPod collection and see the album art. However, the remote control is buggy and almost unusable at times. Sometimes it is unresponsive and takes many key presses before it moves, sometimes it does something completely different or even moves backwards through the menus. But, I would have to imagine that DLO has since fixed these issues in their latest homedocks. Also, when you start your car it will not automatically begin playing, but you only need to press Play and it will pick right up where you left off. Finally, the album art is small and is too slow and buggy to load while playing music. However, I have not yet found a better way to watch iPod movies and music videos on the road, than using this type of setup. It will also work with the iPhone, but will playback music only (no video) and will not charge the phone while it’s plugged in. All things considered, it turned out to be a clean and successful install that I’m proud of.